What sound is cuter than the jingling sound of your kitty’s collar as she trots into the room to give you some love? If your cat doesn’t have a collar yet (or needs a new one), you might find this article super handy. Why? Because putting a collar on your cat is definitely a worthwhile consideration to make as a pet owner—even if your furball is indoors only. 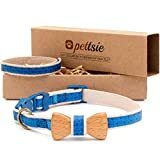 To help you find the best cat collar for your kitty, we’re going to highlight some of the main purposes and benefits of cat collars, point out what to look for when selecting the right one for your animal, and review the pros and cons of the top 5 cat collar brands we found in our research. What Do Cat Collars Do? A cat collar makes medical information about your kitty readily apparent. A cat collar can improve the chances of reuniting with your pet after it goes missing. A cat collar can be an adorable and cute way to give your kitty some personal flair. Can Cat Collars Prevent My Cat From Killing Birds? Tags on your cat’s collar can prove that your animal is up-to-date on her rabies vaccinations, which are required by law in every state. If your animal has any other health issues (such as allergies), it’ll be easy for anyone who finds her to quickly check, which can help modify or direct any medical treatment. Ideally, your cat’s collar will have an identification tag on it. If your pet goes missing, Good Samaritans, animal control officers, or other veterinary professionals can simply call you and let you know she’s been found! Plus, a cat seen in the community with a collar on won’t be mistaken for a stray, which could prevent a well-meaning person from bringing her to a shelter. Sadly, thousands of unidentified cats with human families are sent to shelters every year, and many of them aren’t reunited with their forever home. Of course, because identification tags and collars can sometimes fall off or be taken off, many pet owners opt to have a microchip implanted in their kitty, as well. A microchip is like permanent identification that can be detected with a microchip scanner and digitally stores your contact info in a microchip database registry. But for ease and speed, an ID tag and collar is still preferred for many pet parents—a Good Samaritan, after all, probably won’t have a microchip reader, but can easily call you on their cellphone! Let’s face it: there are some adorable kitty collar designs out there! It’s fun to find one that fits your furry girl’s personality…or even yours! In addition to considering the many options listed below, feel free to peruse different collar colors and patterns when choosing a collar, too. Collar injuries are rare but can happen. Potential issues include the collar getting stuck on objects or getting stuck on different parts of your animal’s body (especially the paws, leg, armpit, and mouth). Many vets recommend breakaway or quick release collars. These prevent strangulation and do not have stretchy elastic components nor hard buckles that can accidentally cause damage to your little feline friend. Unless you love spending lots of money, there’s little point in getting a flimsy cat collar only to have to replace it frequently. Many pet owners prefer to purchase a slightly more costly but high quality collar that will last a long time, is easy to clean, and can hold up to weather (if your kitty goes outdoors). High quality collars are less likely to get frayed and damaged, which (as we’ve seen), can also pose a health hazard to your animal. We mentioned that cat collars are great for helping people in the community quickly identify your pet if she goes missing. At the very least, you should have your kitty’s name and your phone number inscribed on the identification tag. Instead of listing your full address, you may simply want to add the town you live in. At least one study showed that the majority of the cats in their sample tolerated their new cat collars for up to 6 months after first getting one. Research like this suggests that contrary to popular opinion, the right collar can be comfortable and pose minimal to no issues for kitties—but only if it fits correctly! Your cat’s collar needs to be loose enough so that it won’t pinch her neck, but not so loose that it slips off her head or easily catches on things or other parts of her body. Here’s a quick fit test: you should be able to easily slip two fingers between the collar and your kitty’s neck while she’s wearing it. You can also simply measure your kitty’s neck then add one or two inches when adjusting the collar. If you have questions, it’s always wise to run them by your local vet. He or she can make sure the collar is fitting appropriately (especially if your kitty is still growing or recently had a change in weight). While you can’t know for sure how your kitty feels while wearing her collar, you can look out for signs of discomfort (such as skin irritation, frequent vocalization, or frequent attempts to scratch or remove the collar). The weight of your kitty’s collar will also affect her comfort, especially when she’s young. So avoid hefty collars on super small felines as well as lightweight or thin collars on bigger cats. Brightly colored collars are easier for people to see, so your kitty will be less likely to be mistaken for a stray while wearing a bright and visible one. Additionally, many pet parents prefer to get reflective collars that make their animals easier to spot in the dark when out on the prowl at night. Some pet parents also prefer to put little bells on their kitty collars so that cats can be heard as well as seen readily. This may be especially helpful for pet owners with visual or hearing impairments. Research shows that domestic cats are responsible for the extinction of at least 22 species of birds across the globe! Of course, cats are born hunters. Stalking and killing prey is instinctive for them. But it’s not pleasant to find your kitty at the door with a dead or dying critter—especially since this may expose you and your family to disease. Interestingly, there is some evidence to suggest that put a brightly colored and brightly patterned collar on your cat may prevent her from killing birds and certain other small animals. This is because many wildlife critters have great color vision. This means they will be able to spot your kitty-collared girl as she crouches in the bushes! The takeaway? If your cat frequently kills snakes, birds, and other creatures, you may want to have her wear a colorful collar or collar cover. This simple strategy allows her to healthily exercise her “killer instincts” while giving birds and other creatures a better shot at avoiding injury or death. The Rogz Catz collar can be adjusted to fit cats of 6.6 lbs, +8.8 lbs or +11 lbs. It also comes with a removable bell so you can hear your feline in and around your home and easily pick her out from other cats in your household. The collar width is intended for kitty necks with circumferences of 8-12 inches, and the material is scratch-resistant, reflective, and glow-in-the-dark. It also features an adorable fish pattern along with four other styles! 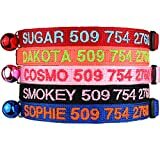 3/8" Wide Collar that Adjusts fully for neck circumferences of 8-12"
From the American company GoTags, these breakaway cat collars are brightly colored and can be completely customized. You can actually have your kitty’s name and your phone number embroidered right into the durable and tough nylon material (up to 22 characters). Select from five collar colors and 15 embroidery colors. These collars also have a 3/8 inch width, making it ideal for felines with an 8-12 inch neck circumference. Most users find that the quick release collar is sturdy but effective, although a few have reported the buckle breaking or the collar going missing after one or two uses. 5 Collar Colors and 15 Embroidery Thread Color options. Collar size is 3/8 inches wide and completely adjustable from 8-12" inches in length. 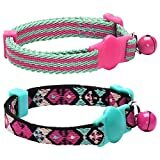 A two-for-one deal from the company Blueberry Pet, these multi-colored breakaway collars are adjustable for kitties with 9-13 inch circumference necks. The material is primarily made with high density polyester that is comfortable and durable. All-match pieces that suit all breeds and every mood for even the pickiest feline! Something for you, something for your little furball! This breakaway collar is made with 100% durable and natural cotton, which could be a huge plus for cats with sensitive skin. The collar can be adjusted for cats with 8-11 inch neck circumferences. It also has a lightweight bow tie made out of wood, a super adorable detail that a lot of pet owners love. Plus it comes with a matching friendship bracelet for you or a loved ones. Kids love it! Bemix Pets offers these breakaway collars in a handy set of 3 or 6. 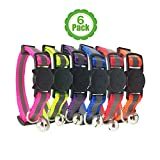 This may be a great choice for you if you have multiple cats and/or small cats, since the durable collars can be adjusted to a neck circumference of 7-11 inches. They come with bells and a reflective strip on the durable nylon material for easy spotting. HIGH QUALITY COLLARS - Our reflective cat / dog collar is solid, made of nylon. Comes with bells. WORKS ON MANY PETS - Great collars for cats and small dogs and other small pets as well. Whether your kitty is indoors or outdoors, she can benefit from a collar. Of all the different collar features to consider, the most important one is a quick release, breakaway clasp. This protects your kitty from accidental choking and other types of injury. Also look for durability, reflectivity, visibility, and price. Cat collars aren’t super expensive compared to other feline products, but you want a high quality one that will last (and that your cat won’t be able to get off). Lastly, have a little fun with the style and colors! Collars can tell a great story about your kitty’s personality and will help her stand out in your home and while out and about in the neighborhood!